KnowBe4’s Account Management Reporting feature provides actionable metrics and insight into the effectiveness of the security awareness training programs running on your managed accounts. Beneath the Reports tab, you can create six different styles of reports to meet the needs of your organization. These reports will help you understand where improvements need to be made to improve the strength of your accounts’ human firewalls. Each report can be downloaded as a PDF or CSV. The presentation of the report (chart, line graph, etc.) will vary depending on the type of data that is included. To create an on-demand report, navigate to the Reports tab. Then, click on the report you’d like to create and enter the required criteria for the report. All reports, with the exception of Account Report cards, can be downloaded to a PDF or CSV. Below the report, you'll see two options, Download Report (PDF) and Download CSV (CSV). Click either option to download your report. Account Report cards can be downloaded to a PDF. The Combine Selection Results setting, available on select reports, will combine your selections into one trendline so you can analyze the selected data as a group. Click the item you wish to move and then click the green right arrow button (>) to move it to the Selected category. Double click the item to move it to the Selected category. Hold down the Ctrlbutton to select multiple items at once and then click the right arrow button (>) to move the highlighted items to the Selected category. Hold down Ctrl + A to select all items on the page and then click the right arrow button (>) to move the highlighted items to the Selected category. Click an item then hold down the Shift button to select a range of items and then click the green right arrow button (>) to move the highlighted items to the Selected category. The same methods can be used to remove items from the Selected category. Click OK to confirm your changes to confirm your selections. 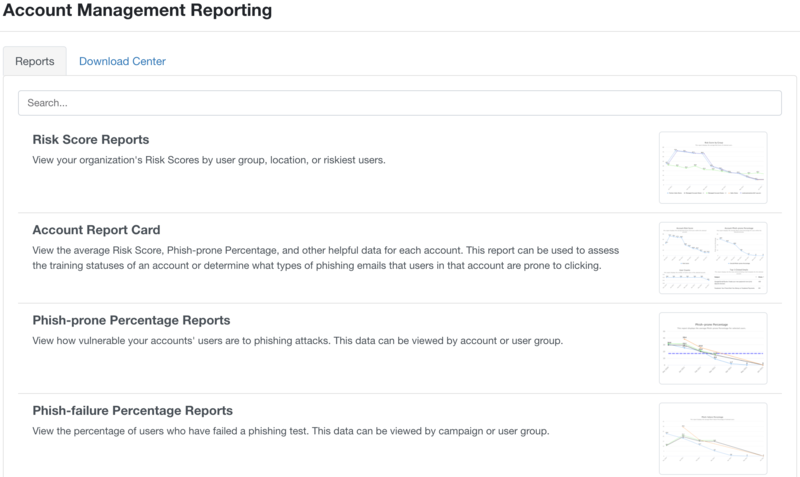 The table below indicates the various reports you can create, the additional filters you can use to modify the reports further, and suggested use cases to help you further your managed accounts' security awareness programs. This report displays the risk score of all users for all accounts or specific accounts within the selected date range. See our Virtual Risk Officer (VRO) Guide for details about how risk scores are calculated. Determine the overall risk score for all your accounts. 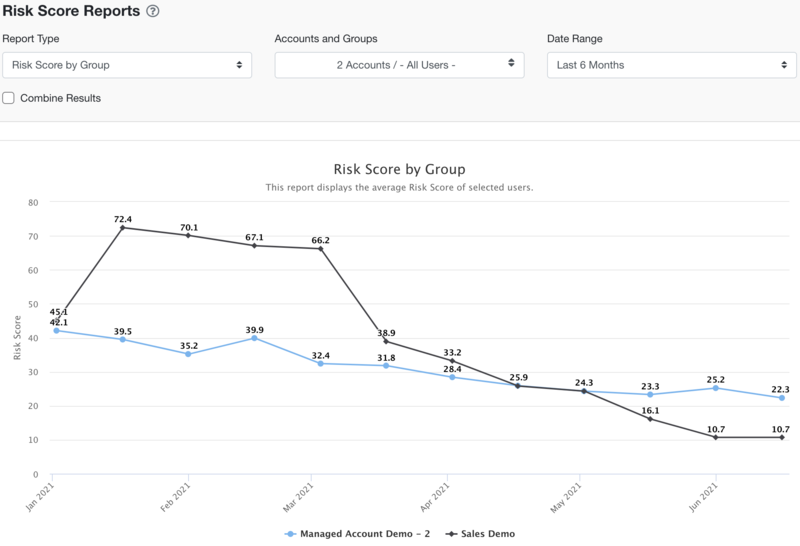 This report displays the risk score of the top ten riskiest users for all accounts or specific accounts within the selected date range. See our Virtual Risk Officer (VRO) Guide for details about how risk scores are calculated. Determine the’ most at-risk users for your managed accounts. This report displays a summary by account of the following reports: Group Risk Score, Group Phish-prone Percentage, Failure Types, Group User Count, Top 5 Clicked Templates, and Training Status. A specific Account and date range can be selected if desired. This information can act as an executive summary to show overall risk and the status of the Security Awareness Training for your managed accounts. This report displays the Phish-prone Percentage for the selected account(s) within the specified date range. See how susceptible a specific account is to phishing attacks. Use this information to determine if specific accounts need more training time, or if their Phish-prone Percentage has improved over time. This report displays a graph of the Phish-prone Percentage for the selected account(s) over time. Identify which phishing campaign caused the most phishing test failures. Use this information to pinpoint the type of training users need the most or the type of attack method users are most vulnerable to. This report displays a graph of the Phish-failure percentage of the selected account(s) over time. See how likely a selected account(s) is to fail a phishing attack. Use this information to pinpoint which of your accounts need additional training or if their Phish-failure Percentage has improved over time. This report displays the status of your managed accounts’ users’ training progress on a campaign(s) over the specified date range and indicates whether or not the users have started, completed or have yet to begin their training. Use this information to keep your managed accounts on track with their training. This can be useful when determining when to send training notifications or reminders. This report displays the status of a course on a training campaign over the specified date range and indicates whether the courses have been started, completed, or are still in progress. Use this information to keep your managed accounts on track with their training course(s). This can be useful when determining when to send training notifications or reminders. Coverage by Account This report displays the status of courses assigned to specific accounts over the specified date range and indicates whether or not the courses have been started, completed, or are still in progress. Use this information to keep all or specific managed accounts on track with their training. This can be useful when determining when to send training notifications or reminders. This report displays the overall Phish-prone Percentages of trained and untrained users for all or selected accounts. See how training affects your managed accounts by comparing the Phish-prone Percentage of untrained and trained users. This report displays the risk scores of trained and untrained users for all or selected account. See how training affects your specific managed accounts by comparing the risk score of untrained and trained users. This report displays the number of active users present in your managed accounts, over the specified date range. Use this information to see the fluctuation of users for all your managed. accounts over time, or to review all of your active users on your managed accounts. This report displays the number of users added to or removed from your managed accounts, over the specified date range. “Removed” includes users archived or permanently deleted from your console. Use this information to keep a track record of all added and removed users with your managed accounts. This may help to discover different trends of user fluctuation. This report displays the login activity of users present in the accounts and/or groups you've selected, over the specified date range. 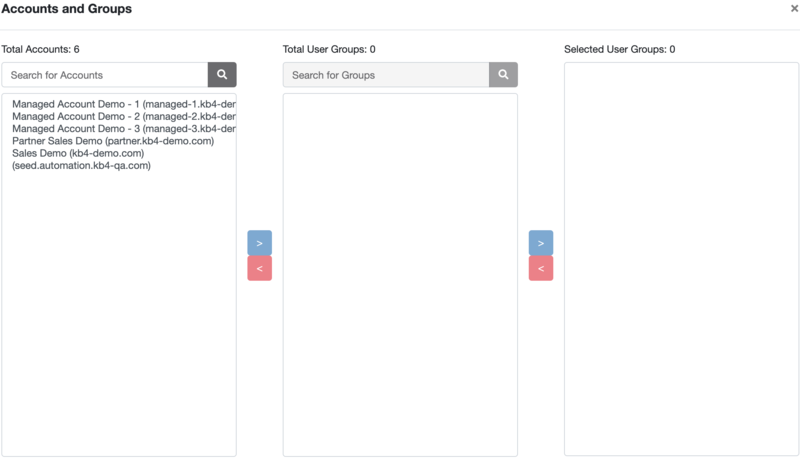 Use this information to view all user login activity across multiple groups and accounts. This may help determine which groups and accounts are not actively participating in their Security Awareness Training. Use the Search… field in the Account/Group selector window to search for specific items or to narrow the results. Create Accounts and Groups with shorter names to make these items easier to find in the Account/Group selector and produce cleaner looking reports. Begin this group’s name with an @ to ensure it is listed at the top of the Group selector for each account.